In a concern over votes, regional government spending is on the rise. In addition, Spain Mandates "Stop the Bleeding" No More Layoffs in Public Companies. Nine months after the local elections, the government has begun to show signs of needing a push to overcome the electoral polls. 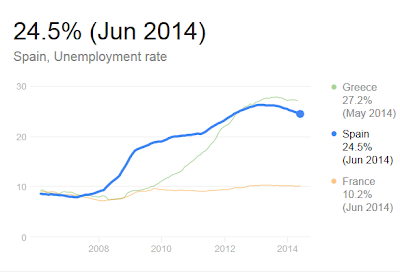 The unemployment remains, along with public debt, macroeconomic data that further tarnishes their results. For this reason, some sources claim that the Government has called on companies possessing some control to hire staff or fail to fire. Although the discourse of government is to "rationalize public spending" and "reduce the number of officials," the fact is that regional governments are the largest employer in the country. Together, they have more than 2.5 million workers, and despite successive cut plans, thirteen regions have increased their spending on staff. According to sources, some companies linked to State or investments through the State Society for Industrial Holdings (Sepi), have begun to put the brakes on the dismissal of staff working at the express request of the Government. Here's the essence: Public companies where the Spanish government has tentacles have been ordered "don't fire". By the way, companies that can't fire, won't hire. Of course that does not apply to the government itself. With government spending going up in 13 of 17 autonomous regions in Spain and with a slowdown in Europe at large, it's quite easy to predict another budget deficit target miss by Spain. Here's one I missed from July: IMF Improves Forecast for Spain, but Expects Unemployment Rate of 19% in 2019. The IMF however has improved its growth forecasts, but also stressed the need to raise VAT and cut contributions to Social Security. The governing body of Christine Lagarde, the Spanish economy expected to grow 1.2% in 2014 and 1.6% in 2015 compared with 0.9% and 1% previously. Also forecast a steady pace of expansion will allow GDP growth of 1.7% in 2016 and 1.8% in 2017, while in 2018 would lead to 1.9% and 2% a year later. Spain's unemployment rate is 24.5% according to Eurostat. The scary thing is the IMF is typically overoptimistic on everything. If Spain actually raises the VAT as the IMF wants, it 99% certain Spain will not hit even the IMF's lowered growth targets. Here's the question of the day: If the IMF is overoptimistic on its 2019 assessment of employment and growth, how long can Spain put up with this?